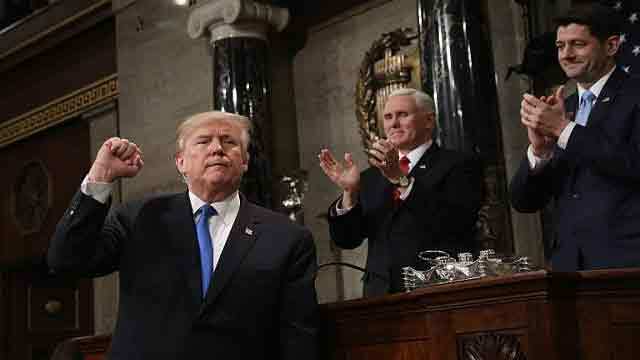 White House correspondent, Jan 31 (Just News): The United States President Donald Trump delivered his maiden State of the Union address Tuesday. Full text of his remarks reached to JustnewsBD through an email sent from the White House department. One of Staub's employees, Corey Adams, is also with us tonight. Corey is an all-American worker. He supported himself through high school, lost his job during the 2008 recession, and was later hired by Staub, where he trained to become a welder. Like many hardworking Americans, Corey plans to invest his tax‑cut raise into his new home and his two daughters' education. Corey, please stand. (Applause.) And he's a great welder. (Laughter.) I was told that by the man that owns that company that's doing so well. So congratulations, Corey. One of my greatest priorities is to reduce the price of prescription drugs. (Applause.) In many other countries, these drugs cost far less than what we pay in the United States. And it's very, very unfair. That is why I have directed my administration to make fixing the injustice of high drug prices one of my top priorities for the year. (Applause.) And prices will come down substantially. Watch.